The first annual Treehouse "Big Day Out" festival presented by Sunwing.ca, is taking place September 13 and September 14 at the Molson Canadian Amphitheatre in Toronto. With two ticketed events each day, this festival features must-see performances by The Wiggles – the number one children's entertainment group , Max & Ruby and award-winning Canadian children's music duo Splash’N Boots. Toronto kids and families are invited to spend a can’t-miss weekend of rockin’ fun! Hosted by Treehouse, Canada's #1 specialty channel for preschoolers, the weekend-long event is jam-packed with exciting activities for kids of all ages. Treehouse Big Day Out will offer two separate ticketed events each day – a morning show from 9:30 a.m. to 12:00 p.m. and an afternoon show from 2:30 p.m. to 5:00 p.m. This special event also will be televised on Treehouse on Saturday, October 4, at 5:00 p.m. ET. To add to the excitement, Sunwing.ca is hosting a special sweepstakes that runs until September 15, for a family of four to win a trip to the luxurious and family-friendly Royalton Punta Cana Resort and Casino in the Dominican Republic. Parents can visit http://www.sunwing.ca/bigdayout/ to enter the contest or stop by the Sunwing booth at the Treehouse Big Day Out festival to enter and learn more about other exciting giveaways and coupons. All attending kids will also receive a 60-page festival program full of activities and colouring pages for even more BIG fun at home! Tickets for Treehouse Big Day Out may be purchased at Ticketmaster. 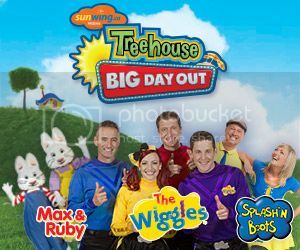 Additional information about the event can be found at http://www.treehousetv.com/big-day-out. We have exciting news too, one lucky Teddy Out Ready reader is going to win a 4-pack of tickets to the Sunday, September 14 morning event. For your chance, simply fill the Rafflecopter form below and Good Luck! My son LOVES Max and Ruby. He would love to see them! Max and Ruby are my little boys favourite!